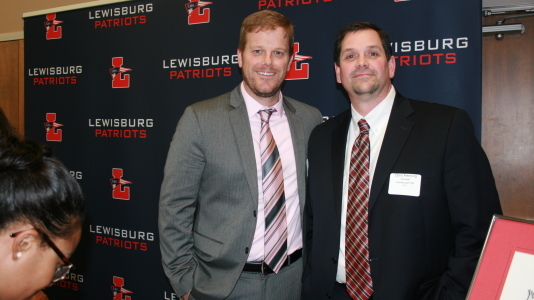 Brad Meadows believes the fundamental responsibility of Lewisburg Middle School educators is to instill in their students the notion that all students can grow and be successful in school and in life. It is this philosophy that propelled Lewisburg Middle School to the position of the #1 middle school in the state of Mississippi for the past two years, based on statewide assessment results. It is also this philosophy that helped this principal obtain DeSoto County Schools’ 2018 Administrator of the Year award. Even though administration is a time consuming profession, Meadows believes it is important to be involved in the community. An active member of DeSoto Hills Baptist Church, he teaches a 5th/6th grade Bible study class on Wednesday nights. This past year, Meadows was asked to serve on the Board of directors to bring a ‘Best Buddies’ chapter to Mississippi. Best Buddies is the world’s largest organization dedicated to ending the social, physical, and emotional isolation of students with intellectual and developmental disabilities. 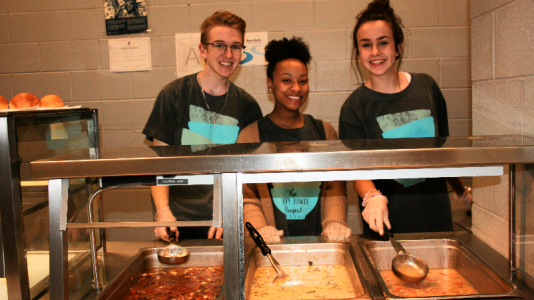 These students are paired with a one-on-one friendship of an LMS peer. Together they share interests, experiences and activities. 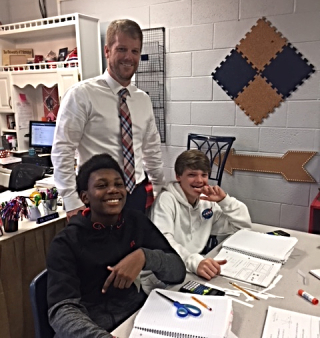 In his 5th year as principal, Meadows has initiated three programs/projects to improve student achievement, including the Patriot Program, Focus Groups and the Remediation Project. The Patriot Program is a positive behavior initiative where teachers reward students with Patriot tokens for being respectful and trying their best. 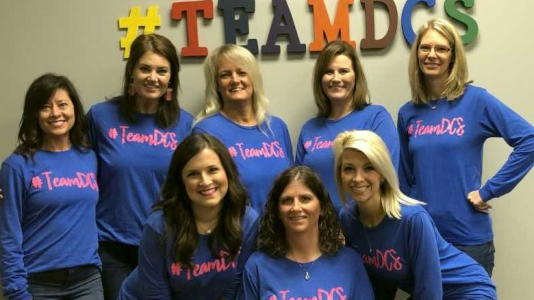 “Focus Groups” are the way he strengthened professional development activities, allowing teachers to share and showcase strategies working in their classrooms. The Remediation Program was established for students who need extra help. Meadows makes sure one English teacher and one math teacher are scheduled for each of the eight periods and are available to provide small group instruction during activity or study hall periods. 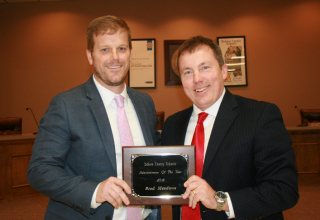 After winning the DCS Administrator of the Year award, Superintendent Cory Uselton nominated Meadows to receive the Mississippi Department of Education’s Administrator of the Year Award. MDE will announce a winner in May. “Brad works tirelessly with 882 students in grades six through eight,” Uselton said. “He has an unmatched work ethic as well as a talent to handle most any situation, always putting first what is best for his students. The students love him, and he is very well-respected by the other principals, teachers and staff of our district office. Our school board members have always been pleased with his performance in our district. 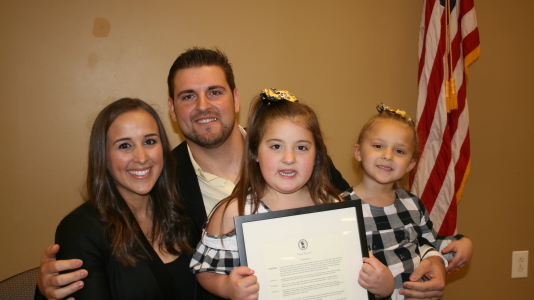 Meadows is married to Lezli Wallace Meadows, a science teacher at Lewisburg High, and they have two children, Presley, 8, and Paxton, 5. The art of teaching basketball takes on a whole new meaning when you look at Olive Branch High School. The Olive Branch Conquistadors have just secured the MHSAA 5A State Championship, a first for DeSoto County Schools boys’ basketball programs. OBHS head coach, Eric Rombaugh, can diagram a game plan in such a way that all players fully understand their role and their responsibilities. He is also an art teacher. 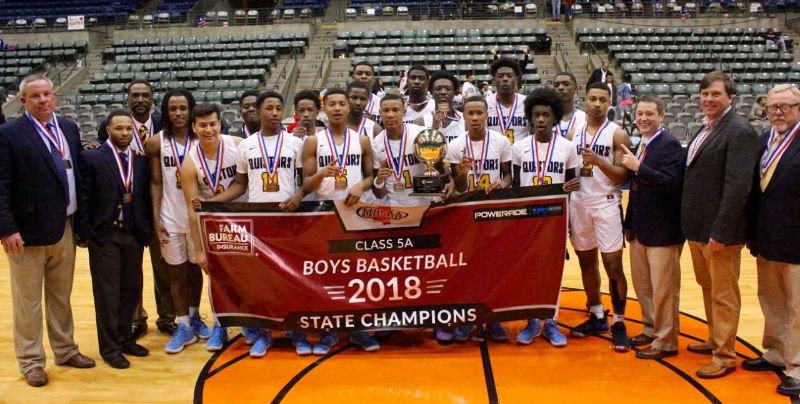 With a 28-4 season, the Olive Branch Conquistadors earned the state title by beating Forest Hill High School in Jackson with a score of 64-44. 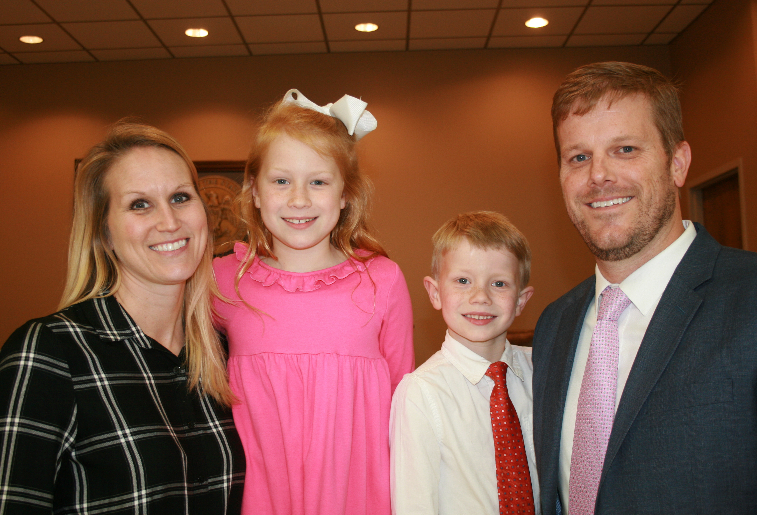 Last summer, OBHS Principal Jacob Stripling recalled one of his first memories as the school’s new leader. He saw a team of young men practicing daily on the basketball court. Stripling realized this team’s great potential. Coach Rombaugh said he often gets questions about being an art teacher/basketball coach. “When I was in college at Western Michigan, I loved art so much that I picked it as my major. The farther I got into it, the better I became. I had an opportunity to work for Disney and some other companies, but I passed on their offers. I still loved basketball, but I also loved art. I decided to combine the two. I changed my major to education and here I am. 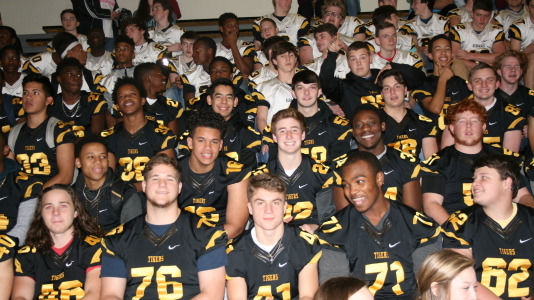 I have been at Olive Branch coaching and teaching art for 13 years,” he said. 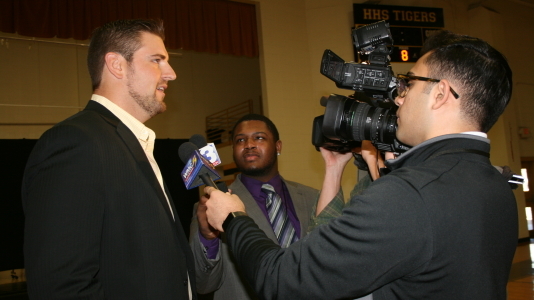 NFL Player Bradley Sowell, a 2007 graduate of Hernando High, was quick to say it took the help of many teachers, coaches and administrators to help him earn a position of offensive tackle for the Chicago Bears. Hernando welcomed him home. 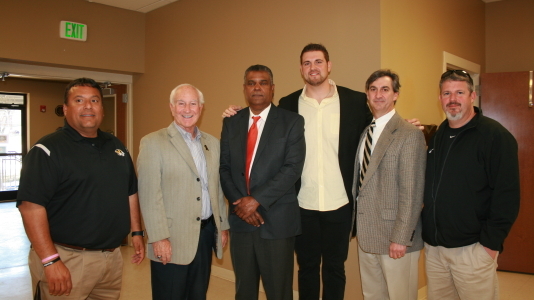 He was honored at three events in DeSoto County, including a reception at the Gale Center by the City of Hernando and the Hernando Rotary Club, an all-school event at Hernando High where his #77 jersey was retired, and a dinner for friends and family in Olive Branch. “The leadership from this town enabled me to become what I am today,” Sowell told the approving audience at Hernando High. Sowell spoke from the heart, saying he quit playing football in seventh grade after an “Oklahoma drill” knocked him off his feet. After high school, Sowell played for the University of Mississippi from 2007-2011. 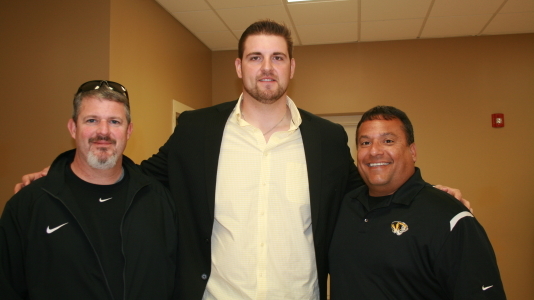 He signed to play with the Arizona Cardinals in 2014 and has also played with the Tampa Bay Buccaneers, the Indianapolis Colts and the Seattle Seahawks before joining the Chicago Bears. Sowell is a free agent and said his career has required him to earn his spot on pro teams. “I am competitive. I understand how struggles can be a gift that results in great blessings,” he said. “It is an honor to be back in my hometown. The Sowell family has been here since the 1800s. To be able to cement my family’s legacy at the high school is something really special. 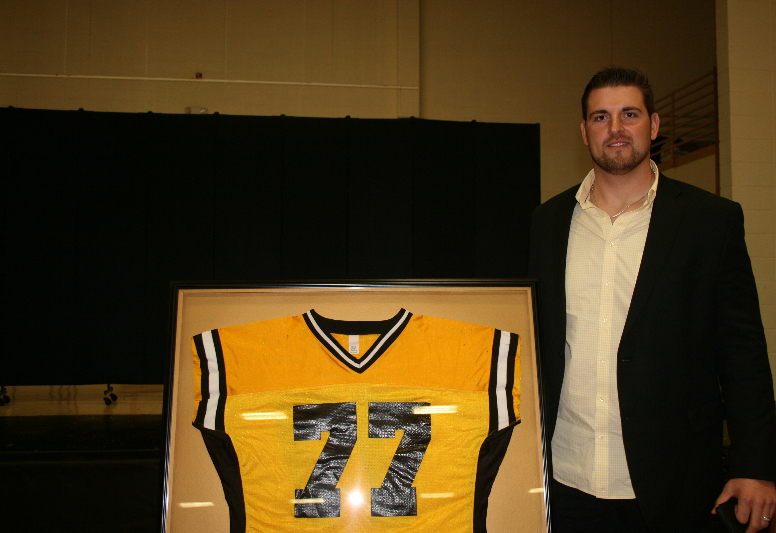 The retiring of my jersey is something we share together,” he said. 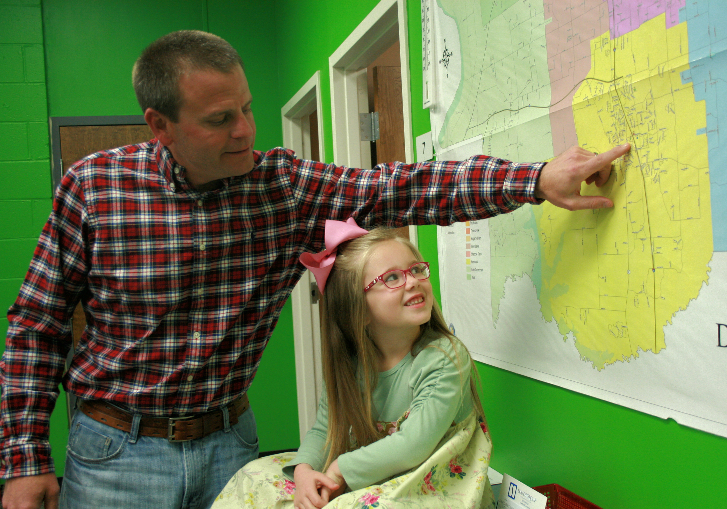 Future kindergarten student Elise Putnam is learning where her school is located from Dallas Culver, director of residency. She will be enrolled at Hernando Elementary. Elise’s parents are Michael and Mallory Putnam. Parents need to remember a special date to register for kindergarten and first grade (for those not currently enrolled in DCS kindergarten). It is Monday, April 9, 2018, from 7:00 a.m. until 6:00 p.m. at the school where the student will be attending. This registration is for the 2018-1019 school year. 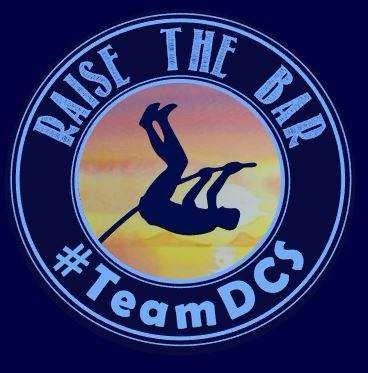 If that date does not work for parents, an alternate provision will take place at DeSoto County Schools Central Services Office (5 East South Street, Hernando, MS) from April 10th through April 30th. On Monday, Tuesday, Wednesday and Friday in April, the office will be open from 7:30 a.m. until 4:30 p.m. On Thursday in April, the office will be open from 7:00 a.m. until 6:00 p.m. This will begin on April 12th. Mississippi law requires that kindergarten students must be 5 years of age on or before September 1, 2018, and first grade students must be 6 years of age on or before September 1, 2018. 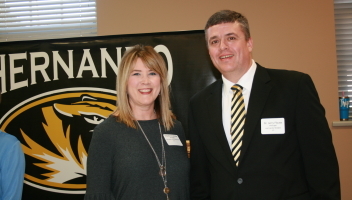 “If a parent is unsure about the school his or her child should attend, he or she may call the DeSoto County School District office in Hernando at (662) 449-7229 and the Residency Coordinator will pinpoint their home on a map and explain their attendance area,” Green said. 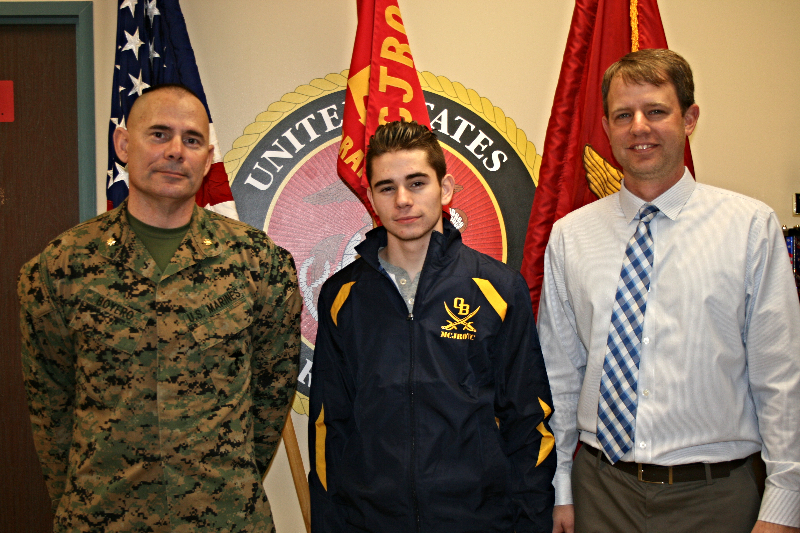 OBHS MJROTC Commanding Officer Robert Boyero and Principal Jacob Stripling congratulate Senior Jake Boyero on U.S. Naval Academy appointment. 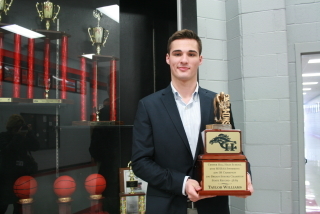 Since the 7th grade, Olive Branch High Senior Jake Boyero has had a life plan to attend the United States Naval Academy in Annapolis, Maryland. He knew it would take excellent grades, superior physical stamina, and extracurricular activities that would give him leadership opportunities to make his application distinctive. 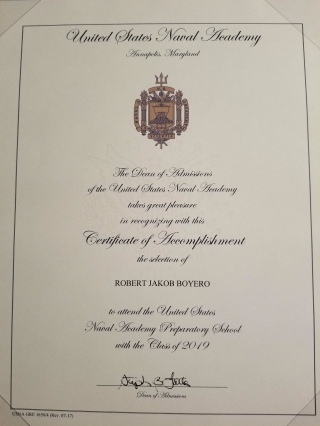 In August, he will begin attending The Naval Academy Preparatory School (NAPS), located on Naval Station Newport in historic Newport, Rhode Island. The following year, if he has a successful year, and he is sure he will, he will be guaranteed a slot at the U.S. Naval Academy. His appointment is worth more than $500,000. More than 17,000 seniors apply to this historic institution. Approximately 1,200 of those applicants receive appointments. To be considered, candidates must complete a pre-application during the spring of their junior year, secure a congressional nomination, and meet the academic, physical, and medical standards set by the academy, along with passing a personal interview. Jake understands the demands a military career involves. His father, Robert Boyero, was a Major in the Marine Corps, and now serves as the Senior Marine Instructor of the JROTC program at Olive Branch High. Jake's older brother is currently serving in the Marine Corps. 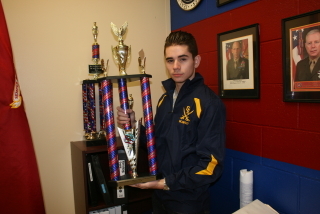 Jake is the commanding officer in the JROTC program at OBHS and helped lead his team to first place in the North Regional Physical Training competition. They are now headed to state competition in April. Besides working out at school two to three times per week, Jake has a regular exercise program at home which involves running two to three miles and using weights to exercise. 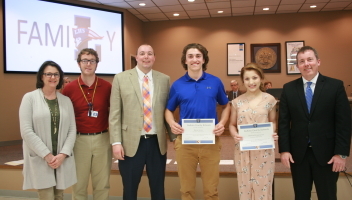 With a 30 ACT score and a straight-A average, Jake also has made time to be on the Superintendent’s Youth Leadership Council, Mu Alpha Theta, and the Olive Branch Leadership Council. What does he do to relax? “I am a ‘gamer.’ I love video games, but that is how I reward myself after I have a hard workout,” he said. Jake’s parents received the Naval Academy packet explaining his scholarship program. Originally, they planned to make the announcement to Jake in front of his JROTC peers the following day. The United States Naval Academy’s students are officers-in-training, known commonly as “midshipmen.” The U.S. Government pays tuition, room and board. Upon graduation from the four-year institution, midshipmen are commissioned as officers in the U.S Navy or the U.S. Marines and are obligated to serve at least five years in their respective branches. Taylor Williams, a 10th grade student at Center Hill High, set a new Mississippi High School Activities Association record in the 100-meter breaststroke with a time of 56.84 seconds. This feat also earned him the honor of ranking No. 1 in the country for this category. 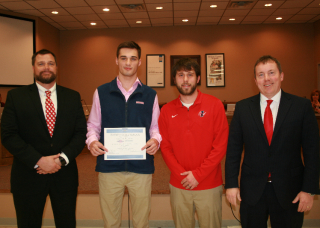 Williams and his coach Joshua Barnett were recognized at the DeSoto County Board of Education for winning two state championships in the 100-meter Breaststroke and the 200-meter Individual Medley. 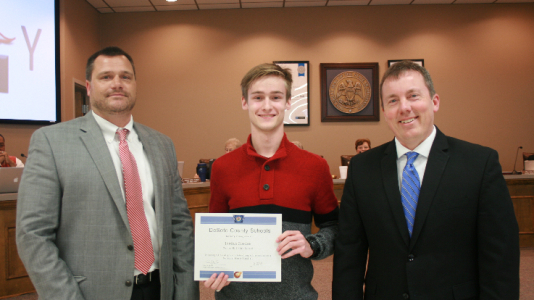 Superintendent Cory Uselton presented Williams with a certificate of achievement at the March 5th meeting. 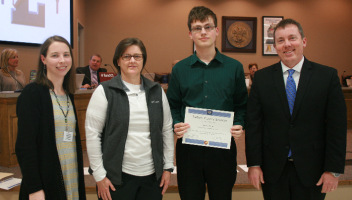 Williams was undefeated in the regular season this past season, and is now qualified to get into Nationals with his State Record breaststroke. 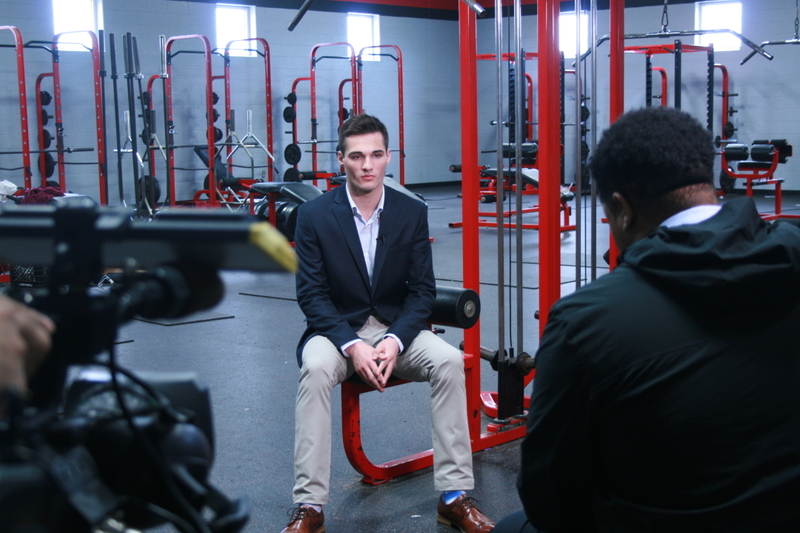 ABC 24 Morning Anchor John Paul interviewed Taylor for the “Cool Kid” segment and learned what it takes to become a champion swimmer. Williams’ goal is to go to a D1 university in two years with a strong swimming program where they will push him to cut three seconds off his time to qualify him to try out for the Olympics. In the past three years, he has broken 17 records in the Southeastern Championship meets that include top swimmers from Alabama, Florida and Tennessee. Williams swims on a Memphis competitive team. He is also the captain of the Center Hill High swim team. 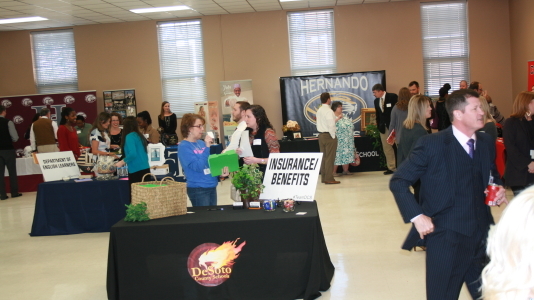 To find the best and brightest teachers available, DeSoto County School District’s Personnel Department launched its first Teacher Career Fair. 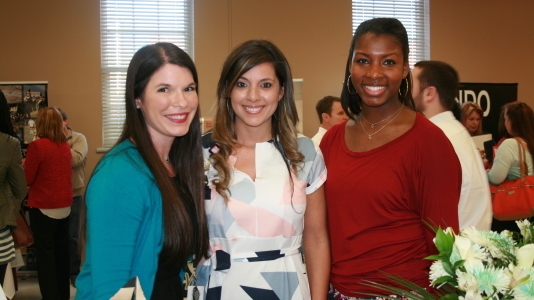 Forty-two principals met with more than 280 teacher candidates. 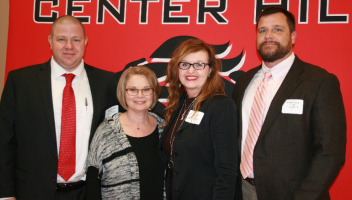 Principals accepted resumes and conducted face-to-face interviews in the boardroom of Central Services in Hernando. According to Van Alexander, associate superintendent of Personnel, principals were given their teacher allotments early, so they would know how many vacancies they needed to fill for the coming year. 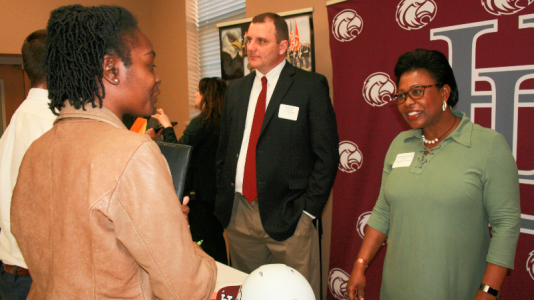 Besides interviews with principals, representatives from insurance and Human Resources were available to answer questions from applicants. 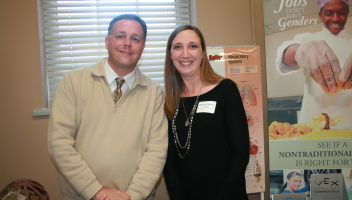 Word of the Teacher Career Fair was spread through local and social media. Also, schools with education programs were contacted and asked to encourage senior students to apply. 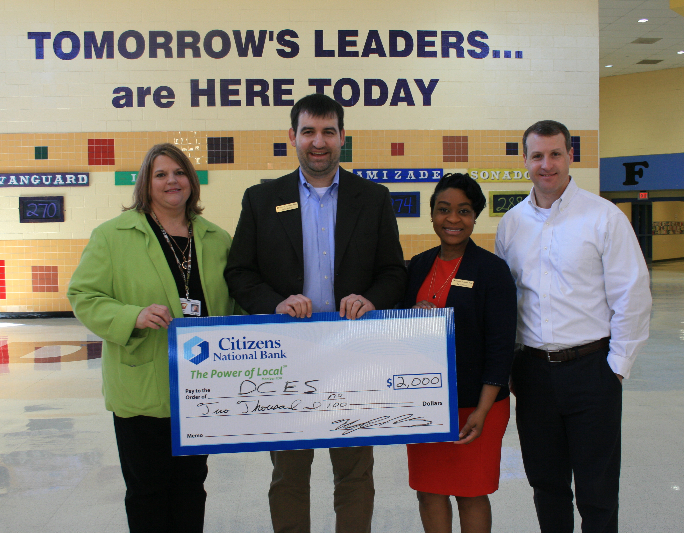 Citizens National Bank is an adopted partner of DeSoto Central Elementary School and supports their positive behavior program of "teams". 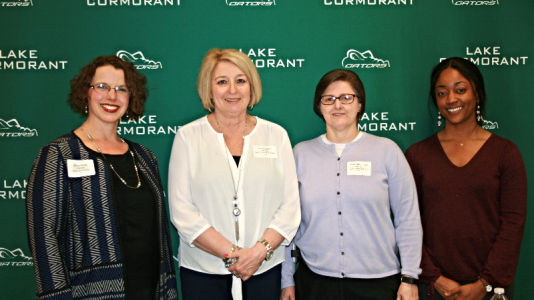 Principal Lisa Nye accepts a $2,000 donation from bank employees Kyle McCoy, April Branch, and Lance Peacock. Cindy Hyde-Smith is set to be Mississippi's first female U.S. Senator. 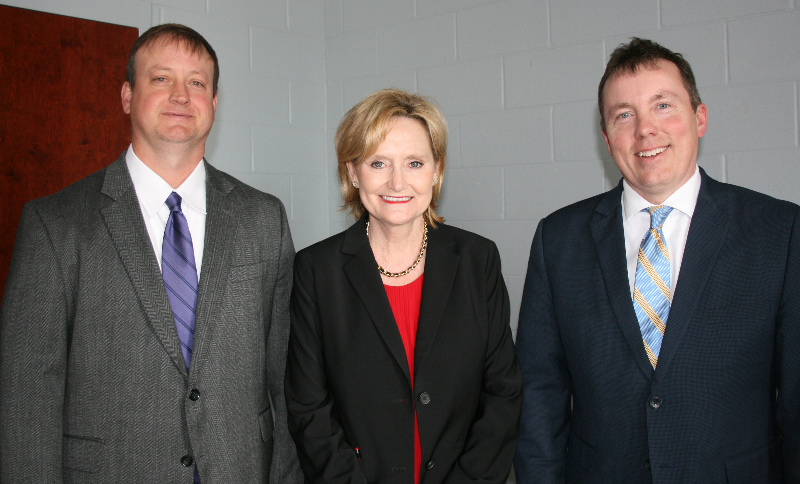 Hyde-Smith is pictured with DeSoto Central High School Principal Cliff Johnston and Superintendent Cory Uselton. Cindy Hyde-Smith, Mississippi’s Commissioner of Agriculture, is set to be Mississippi's first female U.S. Senator. She is filling the vacancy created by Senator Thad Cochran’s retirement. 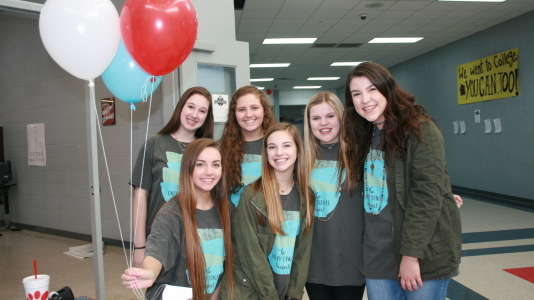 Honor students from DeSoto Central, Southaven and Center Hill High Schools experienced hearing her hopes and dreams for Mississippi at the DeSoto Central Performing Arts Center the day after Governor Phil Bryant announced her appointment. “It’s my hope that I can inspire young people throughout Mississippi to work hard and achieve their goals,” she said. P.R.O.M. has a whole new meaning to students at Hernando High School. 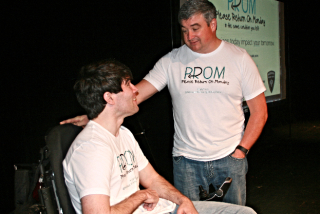 Students gathered in the Performing Arts Center to hear about the P.R.O.M. safety campaign to encourage students to make smart decisions this prom season and beyond: Don’t text and drive, don't drink and drive, and do buckle up. P.R.O.M. stands for “Please Return on Monday (in the same condition you left). Two State agencies -- Mississippi Highway Safety Patrol and Mississippi Department of Rehabilitation Services (MDRS) -- have developed the campaign and are taking it across Mississippi. Sgt. 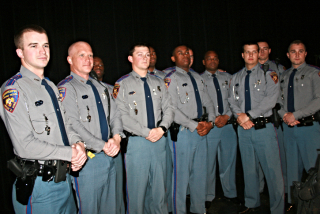 Joey Miller, flanked with nine members of the Mississippi Highway Patrol, started the discussion, and showed videos of distracted teenage drivers. A somber mood came over the crowd when Richard Stafford and his mother Natalie Dedeaux spoke. 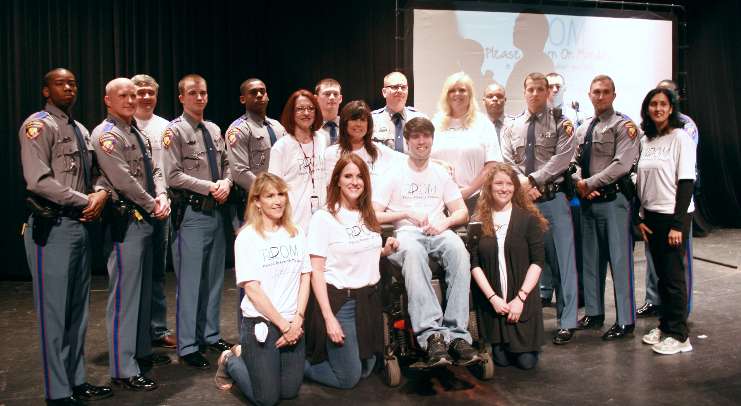 Seated in a motorized wheelchair provided by the Mississippi Department of Rehabilitation Services, Stafford shared his story about how poor decision-making on his prom night led to a serious truck accident and permanent disability. He suffered a traumatic brain injury. He was in a coma for several months. He had to learn to walk and talk again, and it is a struggle every day for this handsome, former football player. Many students wiped tears as they heard the heart-breaking saga of Richard Stafford. MDRS has distributed posters to all eight DCS high schools explaining P.R.O.M. “We want everyone to have fun and enjoy their memorable night, but we do not want those memories to be that of tragedy,” Sgt. Miller said. 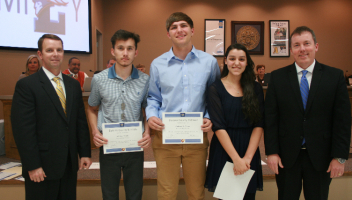 Hernando High students gave the presenters a standing ovation at the conclusion of the program. That is Homer Skelton’s philosophy and it serves him well. 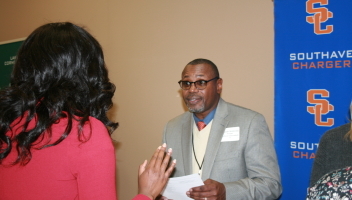 His daughter, Michelle Skelton Chapman, shared her father’s story with the Superintendent’s Youth Leadership Council (SYLC), 38 student representatives from DeSoto County Schools' eight high schools. SYLC is a two year program. One year the students study Entrepreneurship. The council reads a book and each month a group presents a chapter to the council. The students hear from many business leaders during their bi-monthly meetings and takes a local business tour to see business operations firsthand, such as their visit to Homer Skelton Ford. Then in the spring, the council travels to New York City. On alternating years, the students study Government and politics. The students study local, state and national politics through reading, meeting local politicians, taking a trip to Jackson to attend a legislative session, and going to Washington, DC. “My father was born in the Great Depression. He worked in the fields. Even though there were few jobs, he believed in the American dream. He started selling cars, and soon found out he was good at it. He did not change his standard of living. He continued to save and look to the future on what he could do. He worked hard to not have debt. He was richly blessed. 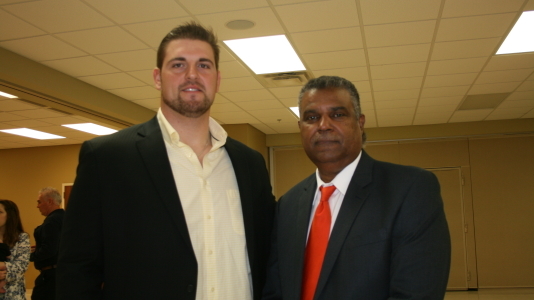 He believes when you are blessed, it is your responsibility to give back,” Chapman said. Chapman said she literally grew up in a car dealership, and her dad always had a job for her to do. She learned all aspects of running a dealership and is now a co-owner in Homer Skelton Ford. Her husband of 33 years is Brian Chapman. He is the general manager of Homer Skelton Ford. In years past, he has spoken to SYLC on understanding, establishing and maintaining sound business practices to run a successful business. While Michelle Chapman supports her husband’s fair dealings, she added that it is never too early to think about the kind of legacy you will leave. “At the end of your life, what you have given to others and what relationships you have established will be your legacy,” she said. 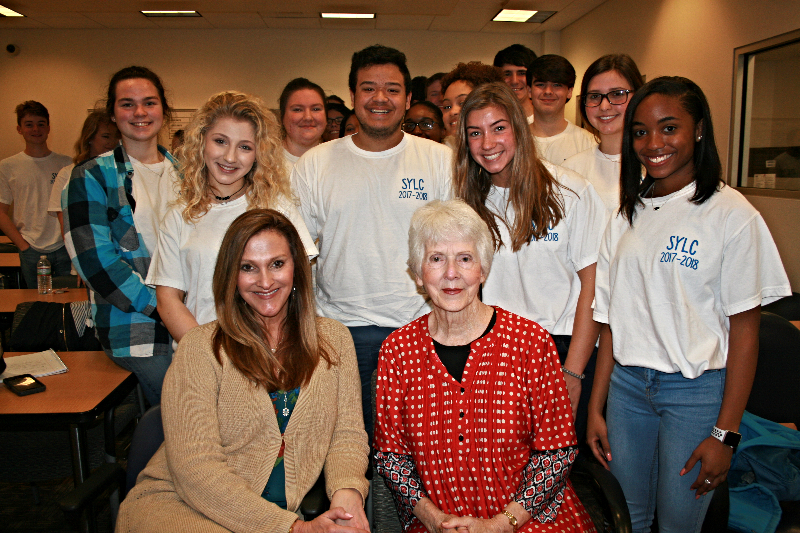 The Homer Skelton Foundation is a sponsor of the Superintendent’s Youth Leadership Council. 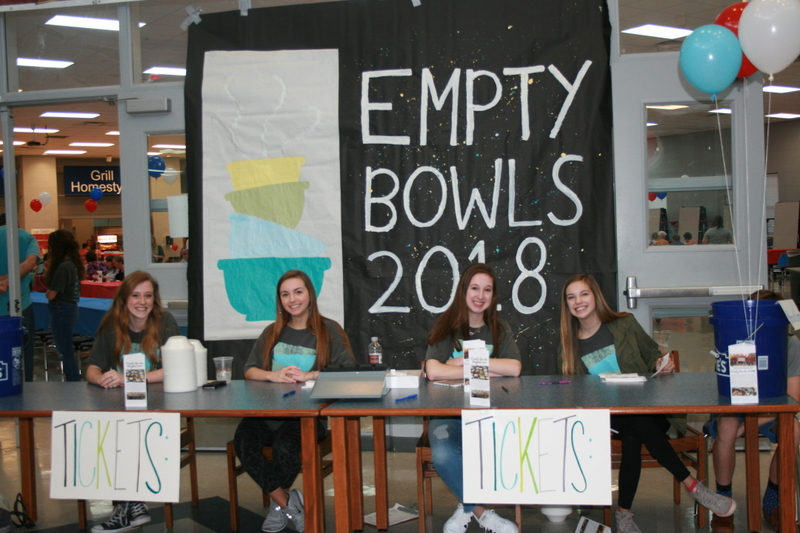 At Lewisburg High School, the Empty Bowls Project uses students’ hearts and hands to fight hunger in DeSoto County. 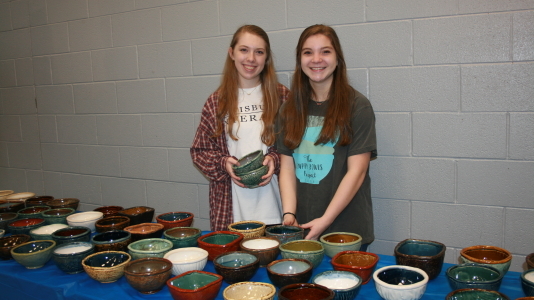 Organized and run by the LHS Interact Club, students, potters and artisans donate handcrafted bowls. 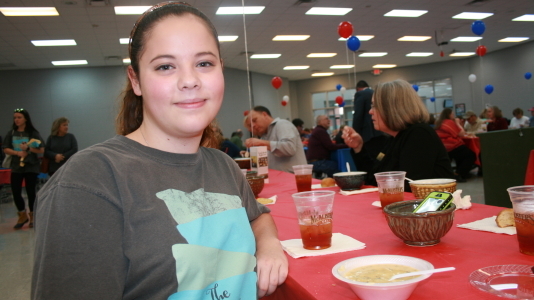 Guests select a bowl and are served soup and bread, donated by local sponsors. They take home their bowl as a reminder of how many go empty around the world. 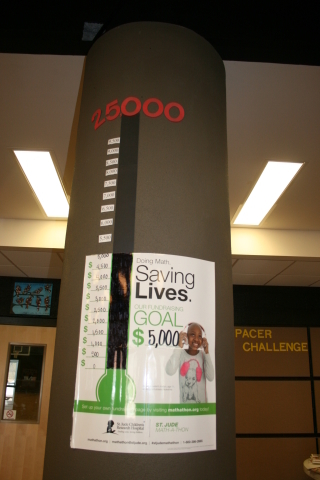 This is the fourth year the Interact Club has worked on this project. 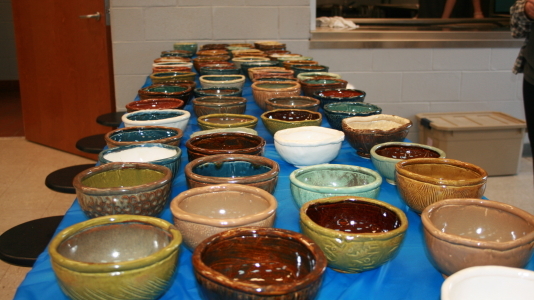 DeSoto Central High art students also donated bowls. Fitts said proceeds from the effort are split between the Interfaith and Olive Branch Food Pantries. Aggie Doddridge was the student chair for the event, and said she enjoyed this year-long project, knowing it will go toward helping other people. 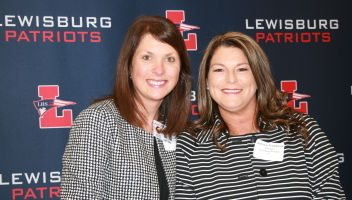 OGCES Principal Stacey Pirtle, Halam Wallace, Ava West and Assistant Principal Sherry Anderson. 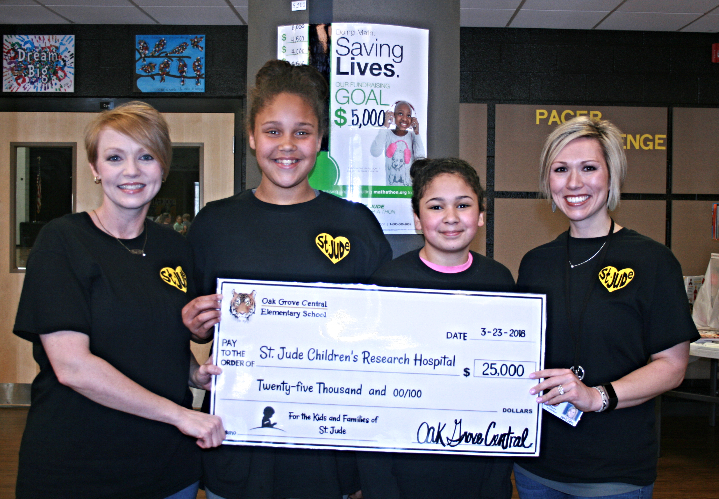 Oak Grove Central Elementary School in Hernando, MS, raised $25,000 for St. Jude Children's Research Hospital. Two students, Halam Wallace and Ava West, approached Principal Stacey Pirtle and asked if they could help launch a campaign for St. Jude. 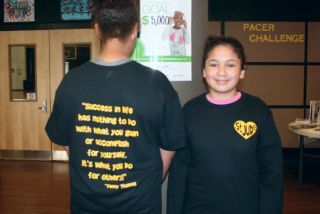 These two students designed a T-shirt with a heart on the front and a quote from Danny Thomas on the back. 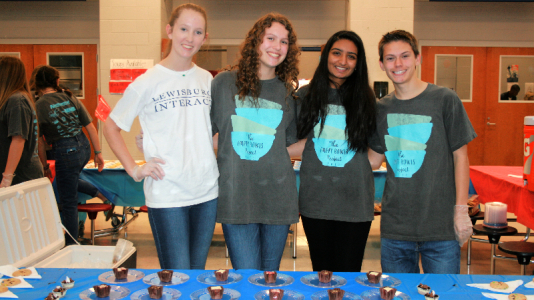 Students sold 500 shirts at $15 each. Students also participated in the St. Jude Math-A-Thon, an education-based fundraiser that teaches students the importance of math and helping others. Students get pledges for every correct math problem they work. Donations were accepted, and Pirtle said it was touching when these fourth and fifth grade students brought their personal savings to school to help reach the school’s goal. “One of our students donated the money he made from cutting grass last summer. Another donated her babysitting money. 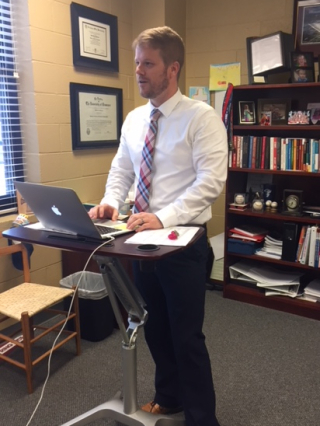 We have two students under treatment at St. Jude, so when students were giving, they knew they are helping students much like themselves.” Pirtle added. A student/teacher basketball game also raised funds during the two-week period they devoted to St. Jude. There are 651 students at Oak Grove. The average amount per student contributed was $38.40. Pirtle said the 3rd nine weeks at her school has been devoted to discussions of “caring.” When her students suggested they participate in a program to help St. Jude, it simply fit with her positive behavior program. Why did the two students want to help St. Jude? 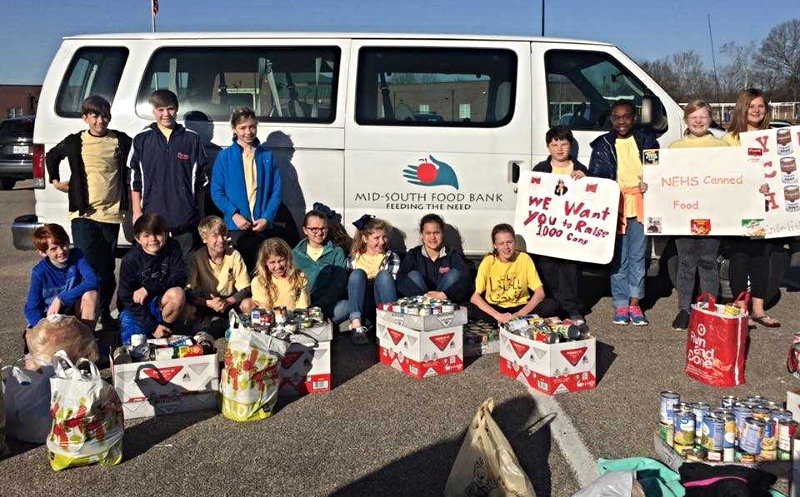 Lewisburg Elementary School donated 1,450 cans of food to the Mid-South Food Bank. All food will go to Olive Branch Food Pantry for distribution. 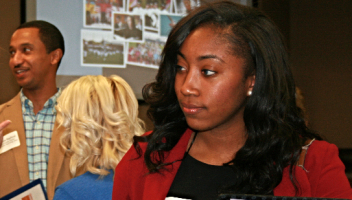 Spotlight teacher Angel Lashlee spearheaded the campaign. 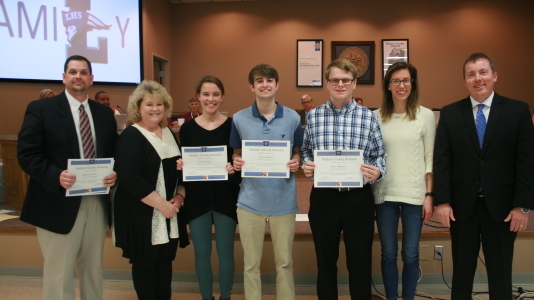 DeSoto County School District has 17 National Merit Finalists who were recognized by the Board of Education. To become a National Merit Finalist, the first step is for a student scores in the top 1% of the PSAT (Preliminary SAT/National Merit Scholarship Qualifying Test). From this pool, Semi-Finalists are named, and then Finalists are selected. Nationwide, 2,500 Finalists will receive $2,500 college scholarships.